The chess board is made up of 64 squares in contrasting colors. The chess board is divided by eight horizontal ranks (from numbers 1-8) and eight vertical files (from letters a-h) so that each of the 64 squares on the board can be identified. The board also has diagonals (from h1 to a8 for example). In the first diagram below, the e4 square is a light-colored square intersecting the 4th rank and the e-file. In the second diagram, the a7 square is the dark-colored square intersecting the 7th rank and the a-file. This square has a pawn occupying it. This method of identifying squares is used when keeping score and is called algebraic notation. In this notation each piece (except for the pawn) is identified by a letter. 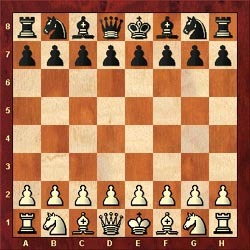 The King="K" Queen="Q" Rook="R" Bishop="B" Knight='N". 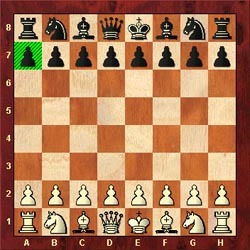 For example, the move "Nf3" means the Knight will move to the f3-square. Feel free to view the following game to get an idea of the board and how the notation works (Thompson-Blood, 1874). Look at the initial positioning of the facing armies. Two important rules should be learned here. The board should be positioned so that the white or lighter-colored square is always on the lower right-hand corner. In addition, always remember to place the queen on her color… light queen on lighter-colored square and dark queen on the darker-colored square. Remember, "white on right… queen on her color." 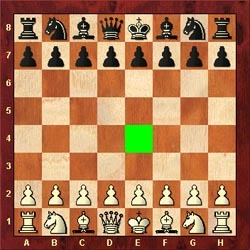 Each chess game starts with two identical armies of contrasting colors. The lighter-colored army is considered "white," and the darker-colored army is considered "black." In these armies, each distinct piece has a function. The movements will be described in more detail in following lessons. Below is a chart giving the value of each piece.